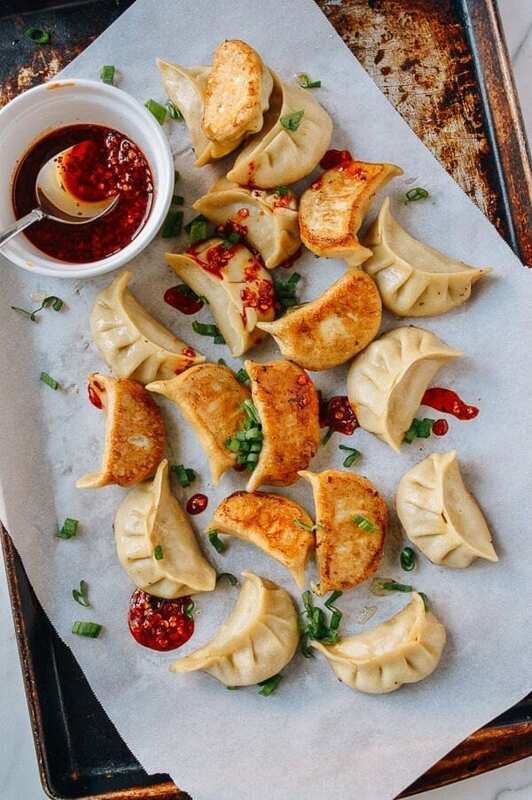 With the exception of our vegetable dumplings, most of the dumpling recipes that we’ve posted on the blog thus far––from soup dumplings to wontons––have used traditional pork fillings. 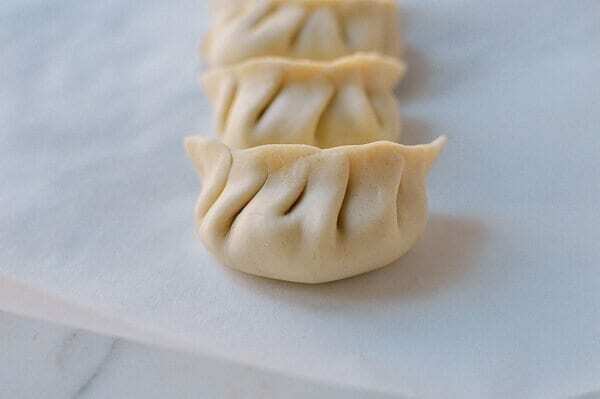 Most (if not all) of the dumplings I grew up eating have been made with some variation of a pork filling, and it’s true that pork is invariably the meat of choice when it comes to the dumpling-making arts. While living in China, however, I was introduced to a plethora of new dumpling types, including dumplings made with lamb, beef, and even tofu. 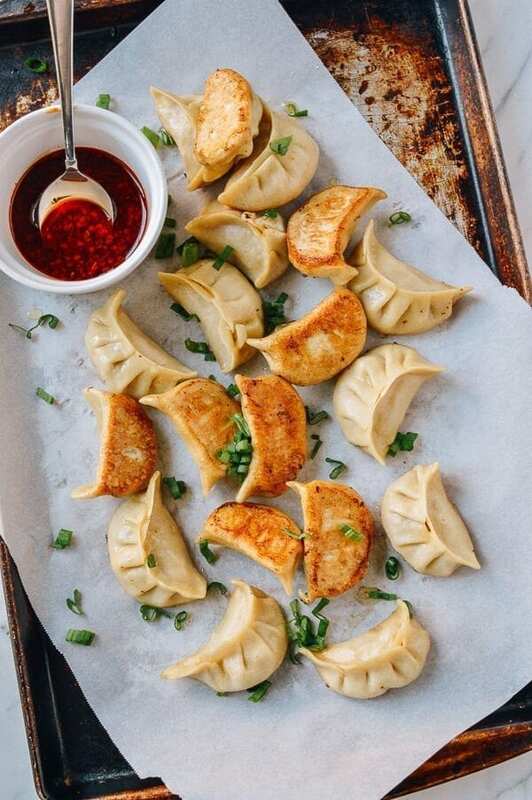 I was also introduced to dumplings that were made with chicken, and I immediately wanted to come up with a version of my own, since several of our readers have requested that we post a recipe for chicken dumplings. This chicken dumpling recipe includes shiitake mushrooms––both fresh and dried––to give them a really deep, meaty flavor. I also included a decent amount of oil in the filling (about 3 tablespoons), to keep the dumpling filling moist, especially if you’re choosing to use lean ground chicken breast instead of dark meat. I have to say, after making these, I’ve decided that chicken dumplings can totally stand up to traditional pork dumplings, and I will be keeping a bag of these in the freezer for the foreseeable future. They’re that good! Put the flour in a large mixing bowl. 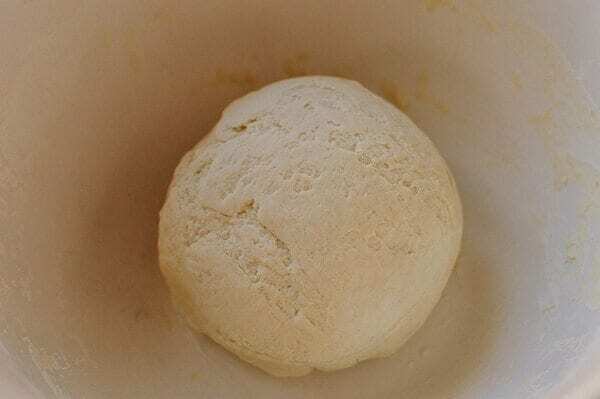 Gradually add the water to the flour and knead into a dough. This process should take about 10 minutes. Cover with a damp cloth and let the dough rest for an hour. In a large pan, heat 2 tablespoons oil over medium heat. Add the onion and cook until translucent. 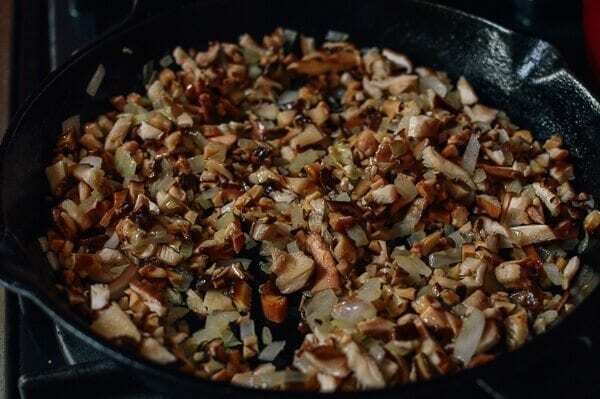 Then add the chopped fresh and reconstituted mushrooms. 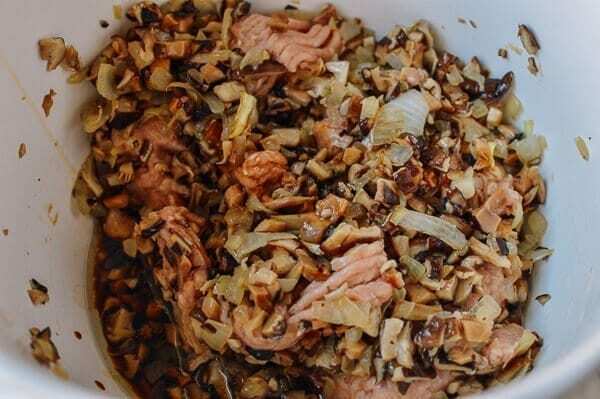 Cook for 8-10 minutes, and transfer to a bowl, along with the ground chicken, sesame oil, soy sauce, sugar, wine, and 3 tablespoons oil. 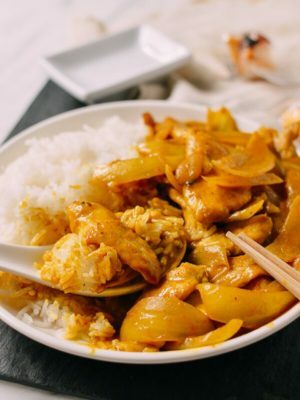 Use a pair of chopsticks to stir the filling together in one direction for about 5 minutes, until the mixture resembles a paste. 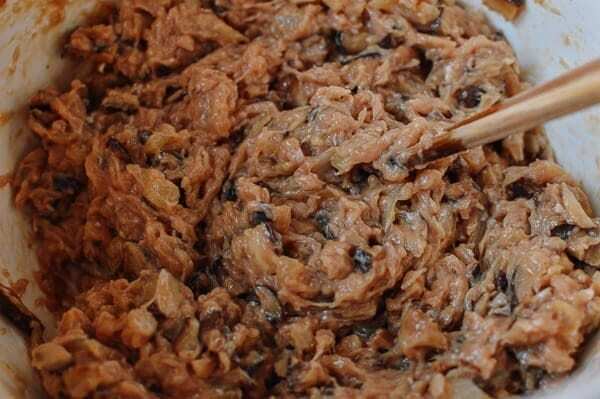 Divide the dough into 48 equal pieces. Roll out each piece into a rough circle about 3 1/2 inches in diameter, and add about 2 tablespoons of filling. Pleat your chicken dumplings and ensure they are tightly sealed. 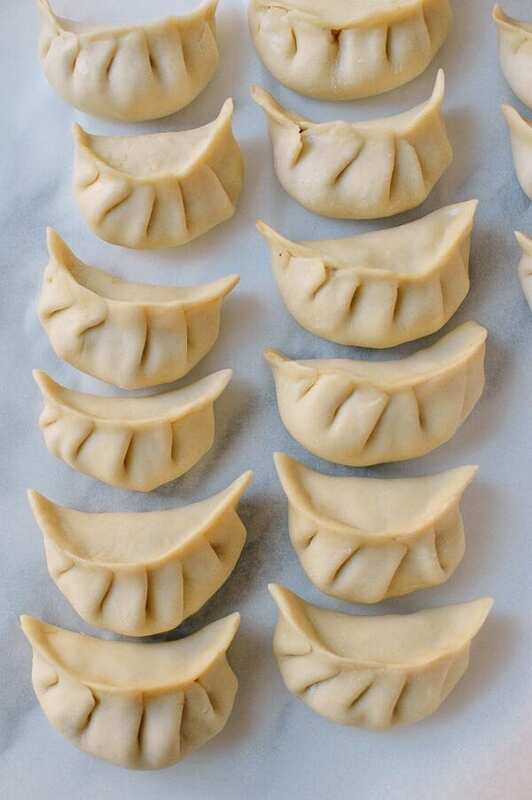 For detailed step-by-step photos showing you how to do that, check out our first ever dumpling post. Continue until all the dumplings are assembled. At this point, you can place the dumplings on a parchment-lined tray (spaced apart, so they aren’t touching each other), and freeze solid. Then you can transfer to zip-top bags and store in the freezer. To cook the dumplings, whether fresh or frozen, add a tablespoon of oil to a non-stick or cast iron skillet over medium high heat. Add the dumplings to the pan, and allow to fry. When the bottoms of the dumplings are lightly golden brown, add enough water to come about 1/4 inch up the pan, and cover. When the water has steamed off, uncover, and allow the dumplings to continue frying until golden brown. 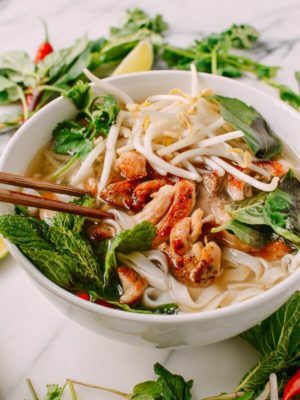 Serve with chili oil or our favorite dipping sauce! 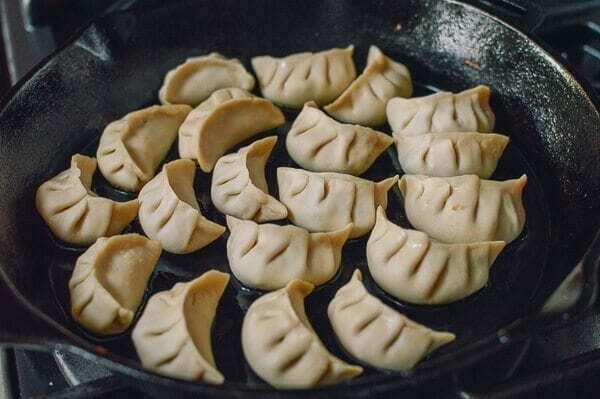 If you’d rather not fry the dumplings, you can also toss them into boiling water, stir gently so they don’t stick to the bottom of the pot, and cook until they float to the surface. They’re great both ways! If you want to learn more about dipping sauces, see our post on how to make a traditional dumpling sauce. 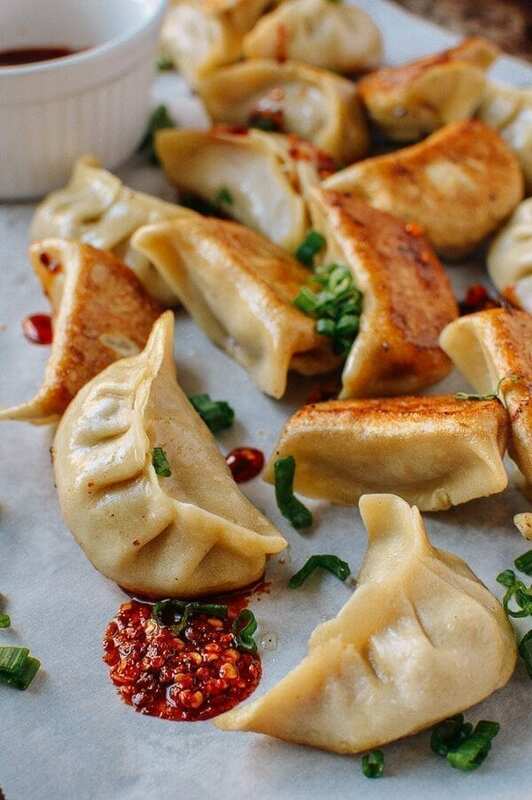 Chicken dumplings uses fresh and dried shiitake mushrooms to give them a deep, meaty flavor. Chicken dumplings totally stand up to the usual pork dumplings! 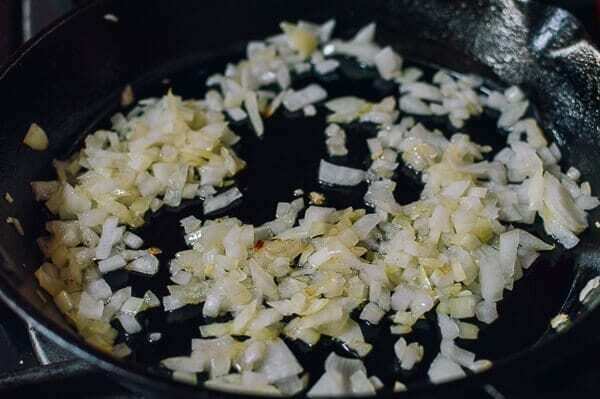 In a large pan, heat 2 tablespoons oil over medium heat. Add the onion and cook until translucent. Then add the chopped fresh and reconstituted mushrooms. 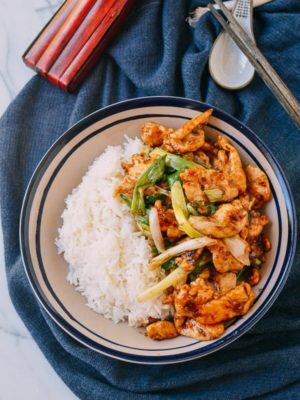 Cook for 8-10 minutes, and transfer to a bowl, along with the ground chicken, sesame oil, soy sauce, sugar, wine, and 3 tablespoons oil. 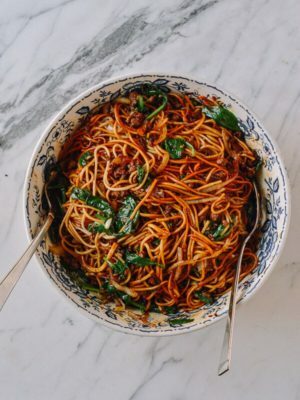 Use a pair of chopsticks to stir the filling together in one direction for about 5 minutes, until the mixture resembles a paste. Divide the dough into 48 equal pieces. Roll out each piece into a rough circle about 3½ inches in diameter, and add about 2 tablespoons of filling. Pleat the dumplings and ensure they are tightly sealed. Continue until all the dumplings are assembled. At this point, you can place the dumplings on a parchment-lined tray (spaced apart, so they aren't touching each other), and freeze solid. Then you can transfer to zip-top bags and store in the freezer. To cook the dumplings, whether fresh or frozen, add a tablespoon of oil to a non-stick or cast iron skillet over medium high heat. Add the dumplings to the pan, and allow to fry. When the bottoms of the dumplings are lightly golden brown, add enough water to come about ¼ inch up the pan, and cover. When the water has steamed off, uncover, and allow the dumplings to continue frying until golden brown. 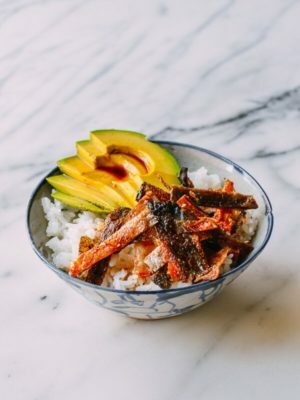 Serve with chili oil or our favorite dipping sauce! If you'd rather not fry the dumplings, you can also toss them into boiling water, stir gently so they don't stick to the bottom of the pot, and cook until they float to the surface. Yes, it is raw! The chicken will cook when the dumplings are boiled, steamed, or pan-fried! May I suggest that you try gelatin with the oil or instead of the oil. it dies the same thing but better. Oil makes things ‘oily’ but the gelatin, especially if made with the stock you plan to use, keeps the meat moist and plays to the idea that you had made the stack yourself. Interesting idea, Karon. Have never thought to do that. I actually have never used gelatin in the kitchen before, but will have to look into it. Thanks for sharing! Wow! 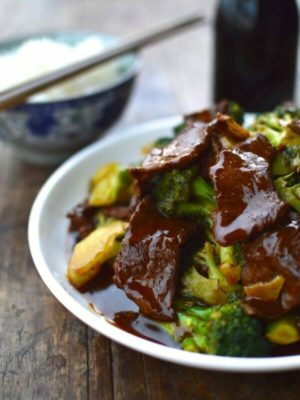 I made these tonight for dinner and my family just scoffed them off. I did use the store bought pastry though. Followed the filling recipe to T. Love your website, the presentation and the friendly banter. 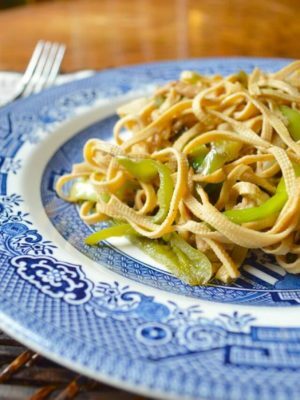 We have decided to make one recipe each weekend and work our way through this website. Thanks from down under. And oh- Happy New Year! Happy New Year, and thanks for the comment, B! 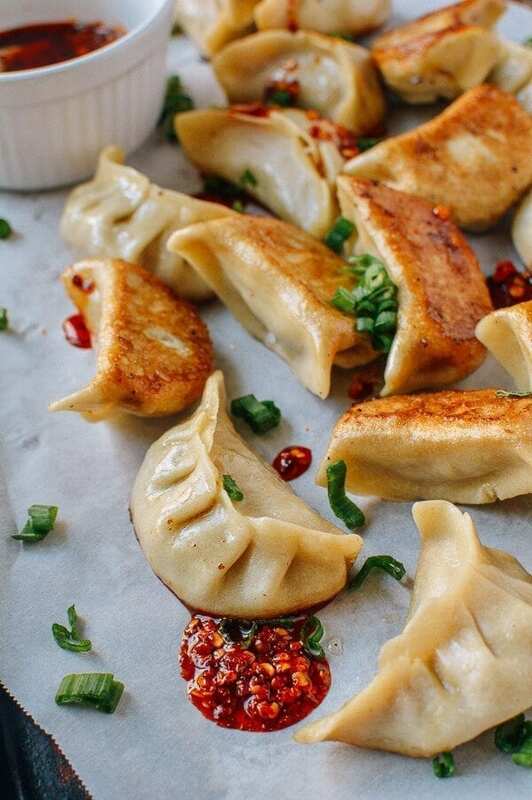 These dumplings are gorgeous and look so delicious. 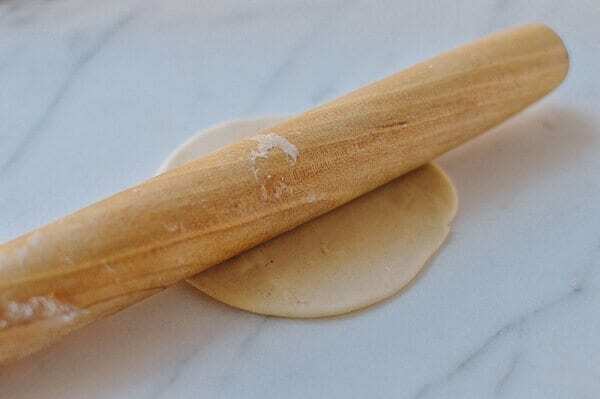 I use the pre packaged dumpling wrappers because it’s easier with 2 kids, but I do love the homemade. Maybe when I can get someone to watch the kids I’ll try it. Thanks for sharing. I’ll use the filling recipe for Chinese New Year. You’re welcome, Happy Chinese New Year Monica! good recipe but my dough didn’t turn out right :( I followed the recipe but it turned out very soft and stretchy so you couldn’t make the pleats (just sort of clump it together). It turned out more like a perogi than a gyoza. still good! but i wonder what i did wrong. any ideas? thx! Hey Julia, sounds like the dough was just too moist. It could also have been related to the moisture of the filling getting on the outer edges of the dough, which makes pleating difficult. Next time, try using more flour on your work surface and rolling pin, to dry the dough out a bit and make it easier to work with. Thanks so much for your question! 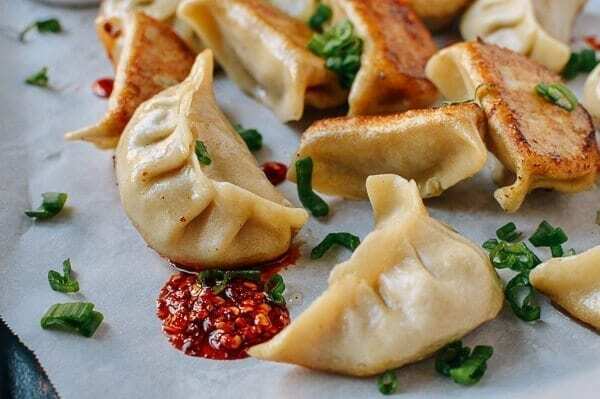 Your dumplings are beautiful! Perfect pleating. Have you tried turkey? 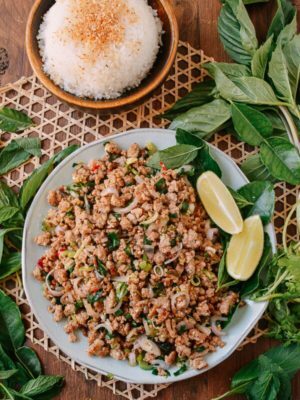 Ground turkey is widely available now and it’s higher in umami than chicken and a nicer texture. Also, adding a TBSP or so of ground chia seed, helps with emulsifying the filling ingredients, and boosts the nutrition/fiber. Hi Jacqueline, ground turkey is a perfect alternative to ground chicken. I think we cook with ground turkey more often than ground chicken. Thank you for pointing it out. for some reason, it’s way easier to get fresh shiitake (most supermarkets offer them along with the other fresh mushrooms) where i live than dried ones. 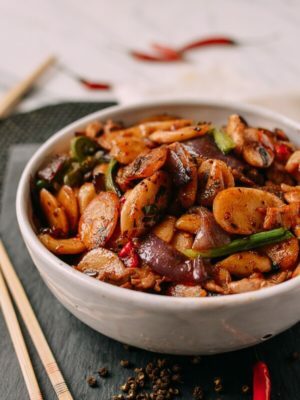 Are dried shiitake more fragrant? What is the difference? I made these dumplings. Even though the ingredients are few and simple the dumplings taste great. I just wish my dumplings look as good as yours does. 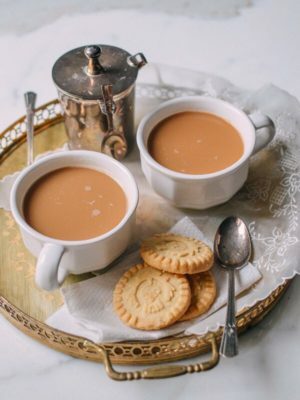 But looks are most definetly not everything, not with this delicious flavour. Well, as you know, dumplings don’t have to look pretty to taste good! 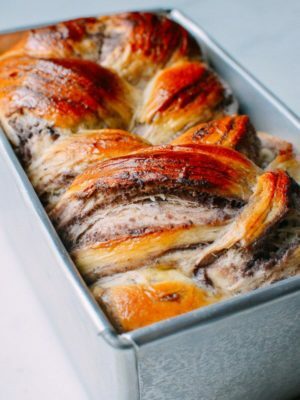 You could even just fold the dough in half and seal them like pierogies if that’s easier! I love dumplings – especially steamed. I was just wondering whether I could replace the all-purpose flour for the rice flour? How would it work? Hi Shanti, it’s not really possible to just replace the all purpose flour with rice flour. If you want to make dumplings with rice flour, that’s going to be an entirely different recipe. Try our Har Gow: https://thewoksoflife.com/2015/10/har-gow/. Love the website. Just a question on the rice flour here – you redirected readers to the Har Gow website if they wanted to use rice flour. 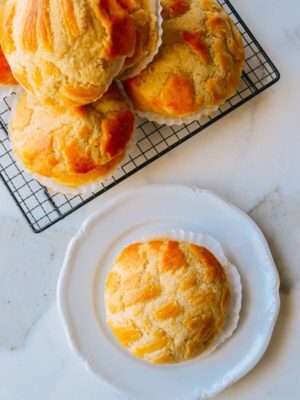 But the recipe calls for wheat starch and corn or tapioca starch. Was it a different recipe you were thinking of, or can rice flour be used to make the crystal wrapper for har gow? Hey Becky, haha GREAT question. Looks like I misspoke. I thought my mom had used rice flour for that recipe but you’re right…it was wheat starch. I know there are gluten-free dumpling wrapper recipes out there using rice flour, but I’m not sure if they yield a “crystal” wrapper look or texture. Thanks for clearing that up! !